On this final day of NaBloPoMo, I’m sharing an excerpt from Kahlil Gibran’s “On Religion” from The Prophet, which is one of my forever favorites. Today, I’m thinking about work, my students, and all the grading ahead of me. I’m also thinking about separate conversations I’ve had this week with a long-ago student and a current student. They were both “extolling my virtues” as a professor and talking about the profound impact I made on them and their peers, not just professionally but personally. Their words were encouraging–because it is always at the end of the semester that I worry over whether my courses did what they were supposed to do and whether I’ve helped my students on their own road to becoming–more than “just” academically. Although my primary goal is to facilitate students’ development as writers, thinkers, and scholars, I see my role as something greater; therefore, I attempt to do more than teach writing, thinking, and literature. I work to push my students toward agency, authenticity, and wholeness so that they can ably meet the challenges beyond the college experience. Like other areas of my life, what happens in the classroom is service, ministry, and an act of worship. It is seeing my work in this way that keeps me motivated and committed to students–no matter how they [and some of the other aspects of professor life] drive me crazy at times. Gibran’s poem “On Religion” blurs the lines and shows us that every facet of our lives must be imbued with religion. Religion is not played out once a week in the company of likeminded others. It is in our every movement, action, and interaction. It is part of our essence, who we are, not a performance or garb we take on and off. I am saturating my soul with prayer and Gibran’s words as I head into the weekend–a period of rest from students and madness. When Monday comes I’ll be equipped for the challenges the final grading period always brings and will handle them with grace. Wishing you a weekend filled with contemplation and rest. 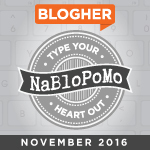 Thanks for reading along for NaBloPoMo18. I didn’t think I was going to make it this time. In fact, I declared I was quitting two weeks ago because my plate was spilling over, but my precious Tyhara encouraged me to keep going, reminding me that I needed to do this for myself–to balance out all the head-stuff. Thanks, Ty! Linking up with Dawn of The Day After in the final Festival of Leaves photo challenge post for 2018. Today was one of those days. Icky. Gloomy. Wet. It rained the entire drive into work, so by the time I arrived [a little earlier than usual], I just wanted to sit at the window till the end of the day and watch autumn happen. The view of campus from my office is always delightful, but autumn brings a whole new level of stunning that tempts me to neglect the long to do list. No giving in to temptation today though. With only five days of instruction left, grading and classes demanded time and attention. Some days, it seems there’s no time to think as I rush from one task, event, or meeting to another, so a stolen moment here and there to look out windows can make a world of difference in my attitude and level of productivity. While I’m gazing, I’m thinking thoughts, mulling over, working things out, or allowing my mind to roam, but I’m also listening for direction, confirmation, presence. The moments are sanity-saving, a way to push away all the other stuff, tune inward and repair–when necessary–without totally checking out. What do you do when time and tasks work against your desire to just be? I have this book called Mess, by Keri Smith, creator of Wreck This Journal. The book encourages making a mess and serendipitously arriving at something beautiful. I look at the prompts regularly, but the book has remained untouched for the five months I’ve had it. Why? Because I’m afraid of making mistakes. Bear with me. I’m making progress. I now take the book to work with me and I am inching toward making a mess in the book. Until then, I’m learning to take risks and accept mistakes with my photography. I know photographers don’t always hit the perfect shot the first time, and of course I rarely do, particularly with an 18-200 mm lens that is becoming frustrating (time for a new one! ), but there was something in the phrase “play around” that gave me permission to make mistakes and not feel bad about the shots that fell flat. I zoomed out for some shots. I pulled the lens all the way in for others. Shooting at 18 mm produced the best bursts, but of course, they were tiny. I knew to crop the image to make the sun appear closer, so here’s the lesson I learned intuitively: in art [and to some degree in life] our messes are often salvageable. The funny thing is, the image I [initially] liked least has sun flare, an effect some photographers try to achieve, according to Amanda.